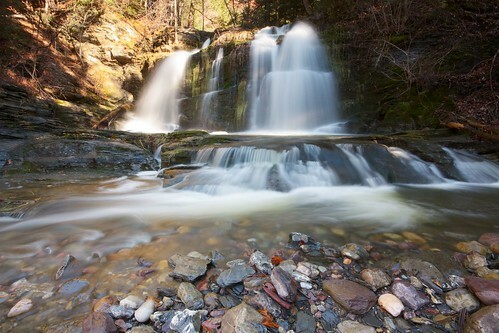 A hundred yards from the aptly-named Bittersweet Falls Road, the Beaver Brook cascades over a formation of marble and dolomite to create a beautiful 18 foot cascade. Above Bittersweet Falls, the Beaver Brook cuts a deep ravine through layers of black slate. 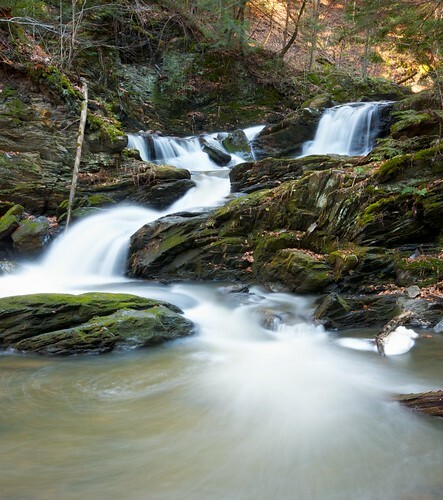 The gorge can be difficult to traverse without getting one’s feet wet, but is filled with cascades and mossy bottoms ringed by ferns and overshadowed by hemlocks. I headed out the door today planing to swing by Bittersweet Falls for a few quick shots before driving out to the Dead Creek Wildlife Management Area where stargazer05756 has been following the migration of snow geese. I never made it to Dead Creek. After taking a few shots below the falls I climbed up above and noticed an impressive gorge winding upstream. 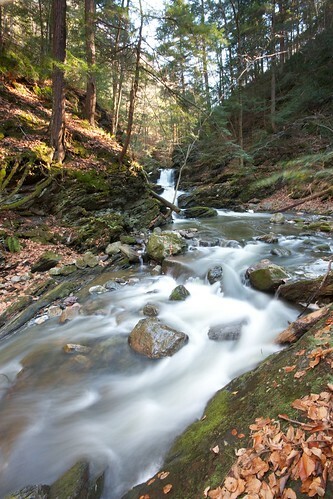 Ever since I was a child I have always loved exploring up cascading streams. There is just something magical above clambering around a rock to find another waterfall or quiet pool surrounded by moss, ferns, hemlocks — and in the south, rhododendrons. The Beaver Brook didn’t disappoint and while its steep slate side posed a challenge, I hiked about a third of a mile upstream along the stream bed before scaling the hillside and quickly walking back to the car from above. The Northeast Waterfalls site has directions and more info.